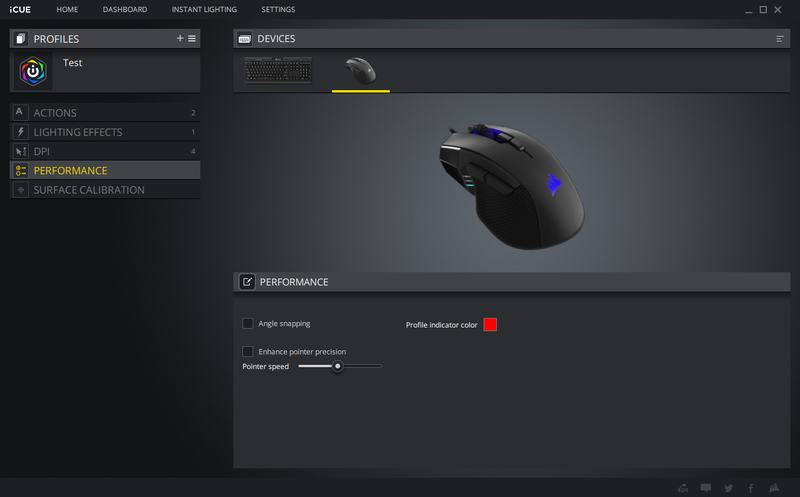 I’ve detailed iCUE a few times before, although it’s been some time since I’ve tested a Corsair mouse. Generally, though, I find it to be powerful and intuitive as well as a considerable improvement on older Corsair software versions. 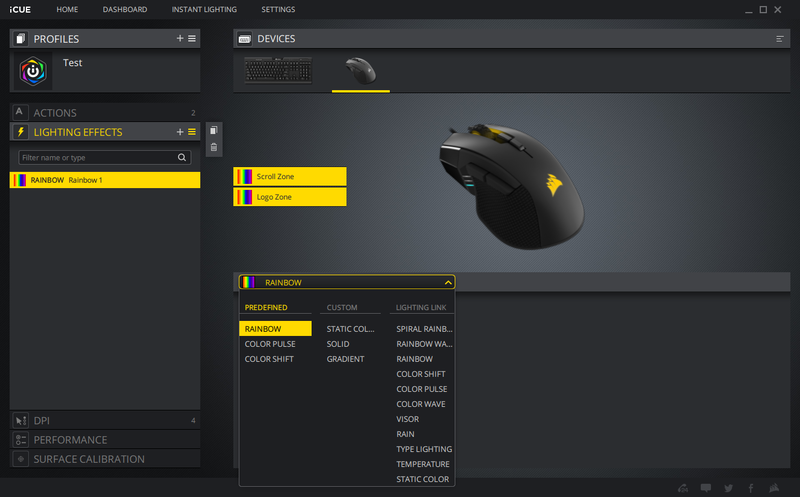 A Dashboard area lets you view system information readouts as well as information related to Corsair hardware in or attached to your system; in the case of the Ironclaw RGB that means assigned custom functions and current DPI levels. A Settings tab allows you to update firmware or the software itself and tweak a few things like polling rate, but the Home tab is where you’ll be doing most of your tweaking. The main screen is organised into a series of expandable menus on the left and a device list along the top. Under Profiles, you can tweak your hardware-based and software-based profiles. 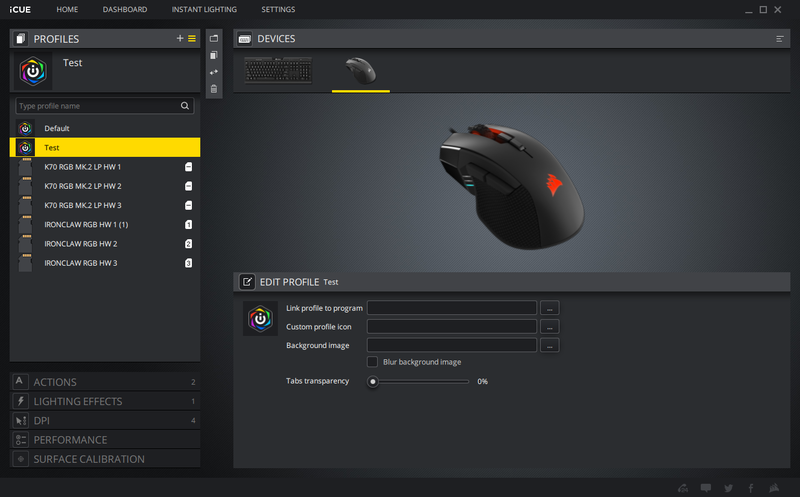 If you have multiple Corsair bits of hardware (like me with a keyboard and mouse), software-based ones will be profiles that you can switch to and which will hold settings for all devices at once. Hardware ones, meanwhile, are of course limited to changing settings for the device to which they are assigned. Actions is the custom function area, and here it’s easy to add, assign, import, export, and delete various commands using the button map and drop-down menus. A global Actions Library also allows you to access custom functions across devices. 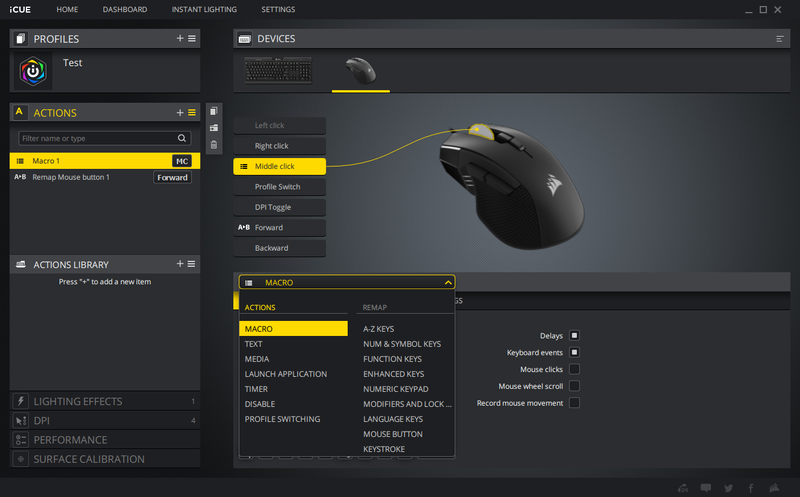 Using a hardware profile here will see certain options removed, such as the ability to tweak the left click or profile switch button, but generally there’s plenty you can do, including custom macros that can be executed from the hardware itself. 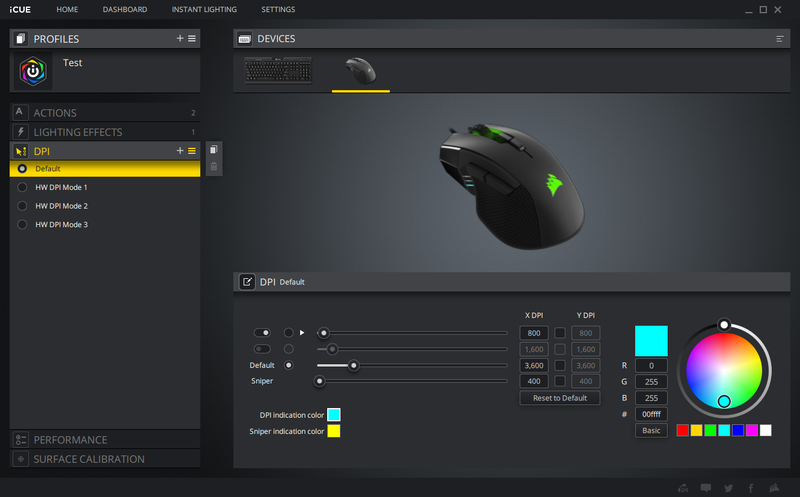 The Lighting Effects menu is simple to understand too, offering a healthy variety of custom RGB settings including ‘Lighting Link’ ones that can apply effects to multiple components and/or peripherals at once. The DPI menu lets you set independent X/Y values for each of the four DPI levels (including sniper), and you can disable any of the three main levels that you don’t need. The colour of the indicator zone is also changed here, and as usual tweaking anything is simple and intuitive. Performance is a menu with minimal options; the profile indicator colour one is probably going to be the most useful, as most people will likely leave angle snapping and acceleration off. 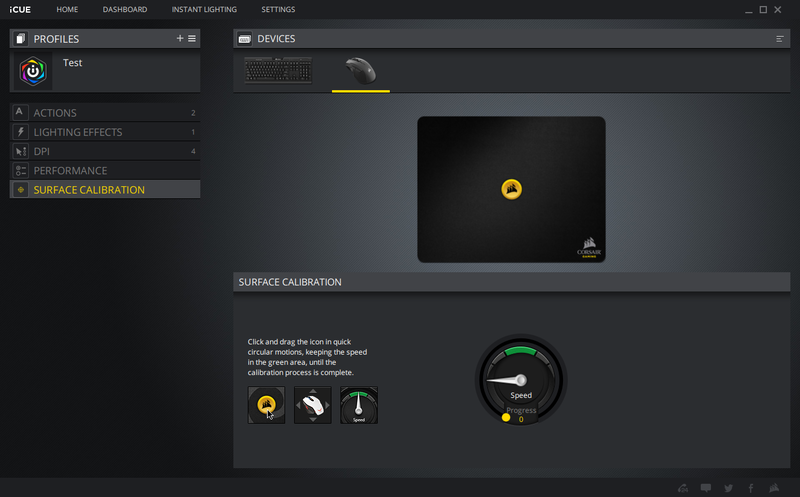 A Surface Calibration option is there if you want it. It works fine, but I’ve always preferred to leave these off and ensure that I’m happy with the surface I’m using without calibration. Pleasingly, the PMW3391 sensor seems to me to be an excellent high-end gaming sensor. While the upper DPI levels become difficult to control very quickly (especially on a 1080p screen, but even on a 4K one), more realistic ones showed no signs of unwanted acceleration and it exhibited no discernible jitter. Again, you might notice a jump or hitch at extremely high DPI levels, but that will be more down to surface imperfections than a sensor fail. 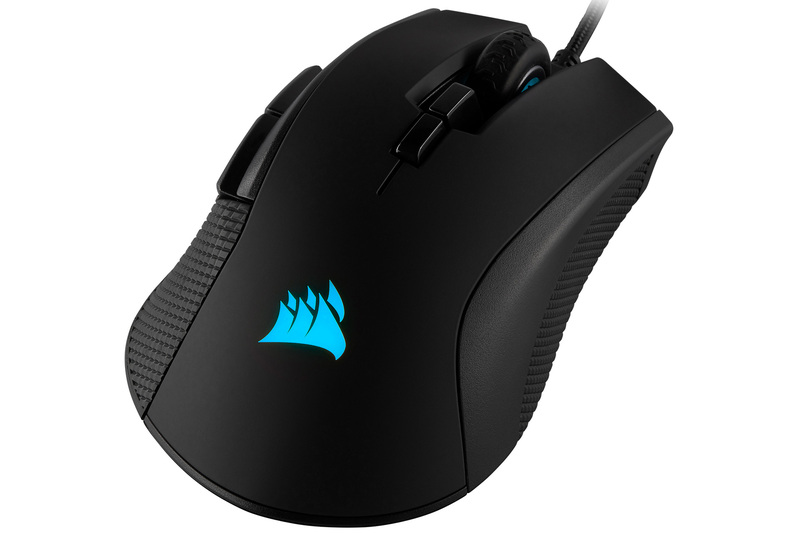 The Ironclaw RGB is a powerful and, in my opinion, much needed addition to Corsair’s growing roster of gaming mice, as palm grippers have typically been left wanting. With a nicely constructed frame, excellent ergonomics, a strong sensor, and typically comprehensive levels of customisation, the Ironclaw RGB ticks all the key boxes. I still think a well-placed sniper button would complete the package even more nicely for FPS gamers, but the software allows you to work around its absence easily. £55 is a fair price for what’s offered too, so I’m happy to bestow a recommendation. CES 2019 Roundup - PC Hardware Highlights! We had a quick peek at some of the latest hardware at CES. Featuring new and exclusive Cherry MX Low Profile RGB Speed switches with 1mm actuation.